Brazilian Jiu-Jitsu is a self-defense system based on the principles of technique and leverage, which allow you to defeat opponents of much greater size and strength. 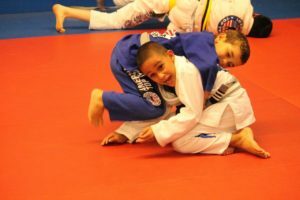 You don’t have to be the largest, fastest, or youngest to be an effective jiu-jitsu practitioner. You simply need discipline and commitment to training. It was designed for real street fighting and developed on the mat. 95% of all fights end up on the ground. What if you have to protect yourself against someone who is bullying you? Someone who is bigger, stronger, and hits harder than you? If you simply try to exchange punches and kicks, you might not stand a chance. What if they muscle you to the ground and start pounding on you? 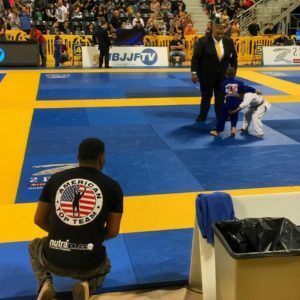 Bad news if you’ve never learned Brazilian Jiu-Jitsu, which can effectively defeat an aggressive assailant using ground grappling techniques. WOULD IT BENEFIT MY CHILD? Absolutely! Jiu-Jitsu, which means “gentle art”, emphasizes the use of technique and leverage. So your child won’t have to rely on size, strength, or speed. Plus, they’ll learn to defend themselves and subdue their opponent in a safe and humane way. Your child will develop physical awareness of balance, better reflexes, flexibility and coordination, They’ll also build character and add positive layers to their personality in the form of greater self-esteem, discipline, confidence, compassion, respect, and good work ethic. The classes are taught in a positive, fun, and friendly manner, so your child will enjoy learning the art of Brazilian Jiu-Jitsu. Muay Thai boxing is a martial art accessible to people of all ages, including children (girls and boys). Following a suitable course in Muay Thai training, youngsters will benefit enormously from the inevitable physical and mental improvements. Muay Thai boxing will improve a child’s self-confidence and self-awareness, while keeping them quick,agile, healthy and strong. Direction/Discipline: Kids participating in Muay Thai Kickboxing learn how to set goals and to do the work needed to achieve them. Muay Thai Kickboxing is a structured program with belts acknowledging personal achievement. Belts signify discipline, effort, time, and commitment to training. Fitness: Participating in Muay Thai Kickboxing will improve the overall fitness level of kids who attend class regularly. Kids engage in a series of conditioning, stretching and strength exercises as part of their regular training. The program is designed to be progressive so each student develops at his or her own speed. Consistent training produces better muscle tone, strength, and flexibility. Benefits derived from training include a lower percentage of body fat, increased energy, and enthusiasm for physical activity. Coordination: Muay Thai Kickboxing contains a progressive series of movements that improves the coordination of participants. Training in Muay Thai Kickboxing requires learning striking techniques and putting them together in a string of movement. This combination develops both specific and sequential improvement in the coordination of the body. Confidence: Training in Muay Thai Kickboxing improves the confidence of kids that will carry over into all aspects of their lives. Through a series of challenges, your child will learn how to approach new situations and successfully navigate them. Challenges are progressive, and graduated, becoming more challenging at each step of the program. This format produces a foundation of self-trust and a willingness to approach challenges. With every new hurdle cleared, your child will develop new confidence and will set them on a path to achieve greater goals in the future, both inside and outside of the academy. Self-Esteem: Kids develop enhanced self-esteem as an outcome of consistent training in Muay Thai Kickboxing. The success that kids experience as part of their training builds a self-respect that translates into self-esteem. They learn to trust, respect, and like themselves for who they are. The self-esteem they develop is strong and durable because it is based on achievement. Enhanced self-esteem will impact positively on how they relate to others, authority, and themselves. Self-Defense: Although most students of Muay Thai Kickboxing do it for the sport, kids learn valuable self-defense skills as well. Kids training in Muay Thai Kickboxing not only learn how to defend themselves in various situations, but develop the confidence that helps them to avoid many of the bully traps. Kids trained in the striking arts learn how to avoid, evade, and escape from many physical confrontations so common to the young. Self-defense is only one of the many benefits of Muay Thai Kickboxing, but it is a valuable benefit for kids none the less. Do you want your child to be parked in front of the TV all summer long? If not, Jiu-Jitsu Summer Camp may be the answer you’ve been looking for!! 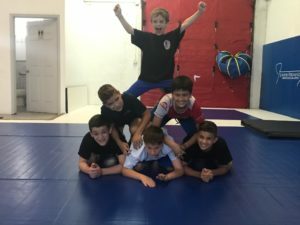 At American Top Team, it is our goal to provide your child with a safe and nurturing after school enrichment program with an emphasis on Martial Arts. Our program operates from school dismissal until 6pm, Monday thru Friday on each regular school day. 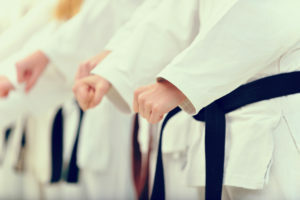 A martial arts Birthday Party is a fun and unique idea for your child’s special day. Our goal is that the birthday girl/boy will have the most fun filled and action-packed day. The kids will participate in some of our most popular class games: crab soccer, tag games (our class favorite), learn about the Mixed Martial ARTS, and much more! Every party is run by one of our adult instructors. Kids Summer Camp Starting in June! Sign Your Littlest Ones Up For Our Little Champs Class for 3-6 Year-Olds!